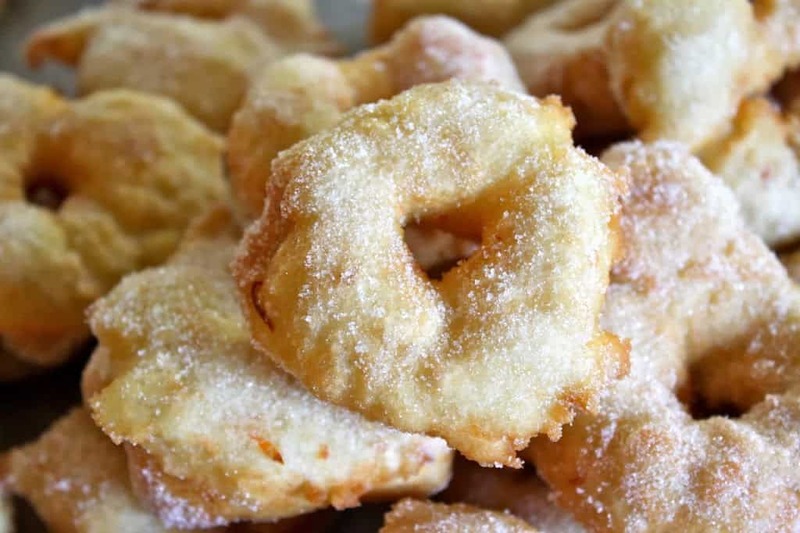 Zeppole or frittelle are traditional Italian Christmas Eve doughnuts which are essentially made from a sticky, flavored version of plain bread dough. There’s nothing plain about them once they’re ready: they’re incredibly delicious and light! 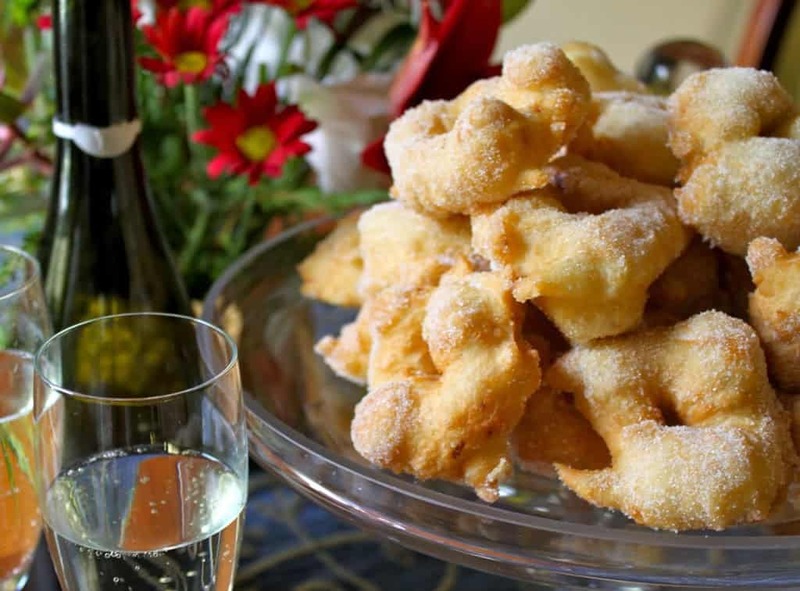 Every year, my mother makes these frittelle (a type of Italian doughnut), for Christmas Eve and we stuff ourselves silly because we just can’t help it–they’re so good! I don’t believe anyone can eat just one frittella. Truly, I don’t think it’s ever happened. I start eating them as I’m standing at the stove, frying them; are you getting the picture here? These babies are awesome! But there’s one thing we always ask ourselves when we’re in the midst of our frittelle frenzy, “Why do we only make these once a year on Christmas Eve?” Of course, it’s tradition to make them then, but what I can’t believe is that we don’t make them more often! Maybe it’s the same reason we don’t make turkey with stuffing and pumpkin pie in April: because it’s tradition to make these dishes at a specific time of year. Or maybe not, because I’m putting a note on my calendar for March 15th, 2014 (as good a day as any) to make zeppole again–yep, I’m gonna be a rebel! Here’s another reason we kick ourselves: they’re so easy to make! You’ll get your hands a bit sticky with dough, but there’s no rolling and cutting like traditional yeast doughnuts! Give them a try, and maybe you will also be putting March 15th down on your calendar, as “Frittelle Making Day”, too. Put the yeast in the water and set aside for 5 minutes. Place the flour, salt and sugar in a bowl and mix together. After the yeast is ready, pour the water and yeast mixture into the bowl along with the juice and peel, and mix by hand until a very sticky dough forms (if using rum-soaked raisins, add them at this time). Cover with plastic wrap and let rise until at least doubled. It will look like the photo below when it is ready. Next, place the oil into a deep pan (I used a wok) and heat to a medium high temperature. Test the oil by dropping a tiny piece of dough into it: if it doesn’t begin to fry right away, the oil is too cold; if the dough browns too quickly, lower the heat as the oil is too hot. 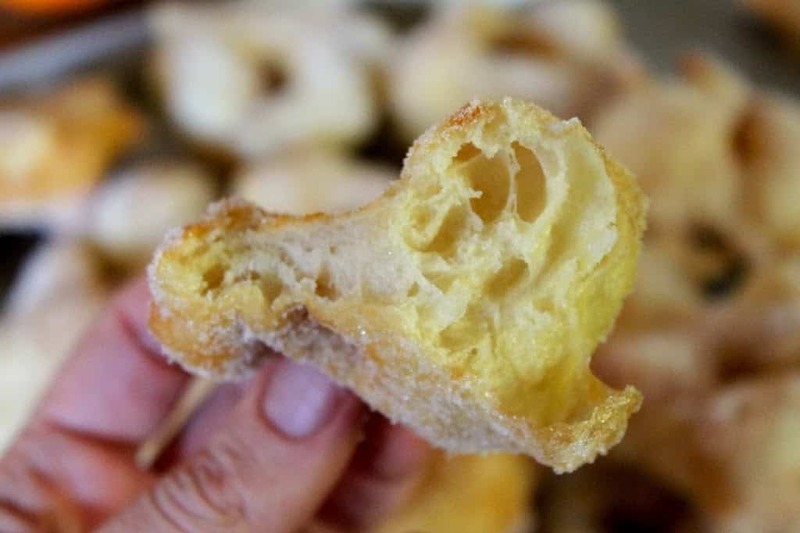 When the oil temperature is correct, take a piece of dough (it will be very sticky) and pull into a doughnut shape with a hole in the center, as shown. Next, drop the doughnut into the hot oil and continue to make more. 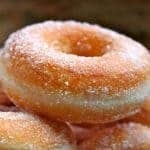 It is necessary to have another person frying the doughnuts while one person is shaping them. It is just too difficult (and dangerous) to do both things at once, since the dough is very sticky. The zeppole will rise and cook quickly, so turn them as soon as they begin to brown on one side. Once they are cooked, remove them from the oil and place on paper-towel lined plate for a minute or two. Finally, dip the zeppole into the sugar and cover completely. Place on a serving plate, if they make it that far! I highly suggest serving these immediately! 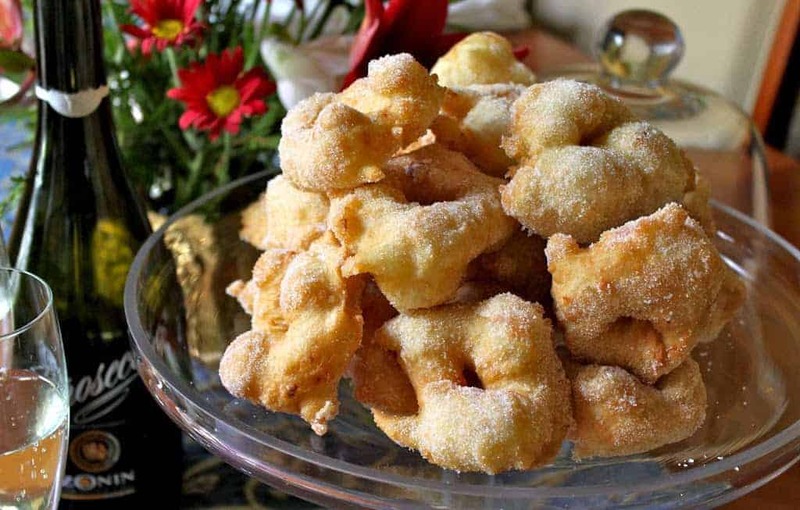 Zeppole or frittelle are truly best when eaten the same day they are made. Light and puffy fried doughnuts made from bread dough, rolled in sugar. Totally delicious and addictive. A traditional Italian Christmas Eve treat! 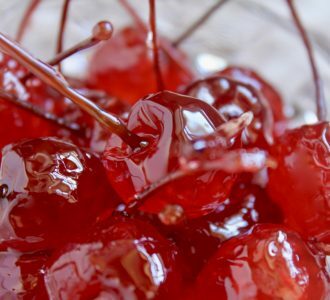 Place the flour, salt and sugar in a bowl; mix together and after the yeast is ready, pour the water and yeast mixture into the bowl along with the juice and peel, and mix by hand until a very sticky dough forms (if using rum-soaked raisins, add them at this time). Cover with plastic wrap and let rise until at least doubled. Place the oil into a deep pan (I used a wok) and heat to a medium high temperature. Test the oil by dropping a tiny piece of dough into it: if it doesn't begin to fry right away, the oil is too cold; if the dough browns too quickly, lower the heat as the oil is too hot. When the oil temperature is correct, take a piece of dough (it will be very sticky) and pull into a doughnut shape with a hole in the center. Drop into the hot oil and continue to make more. 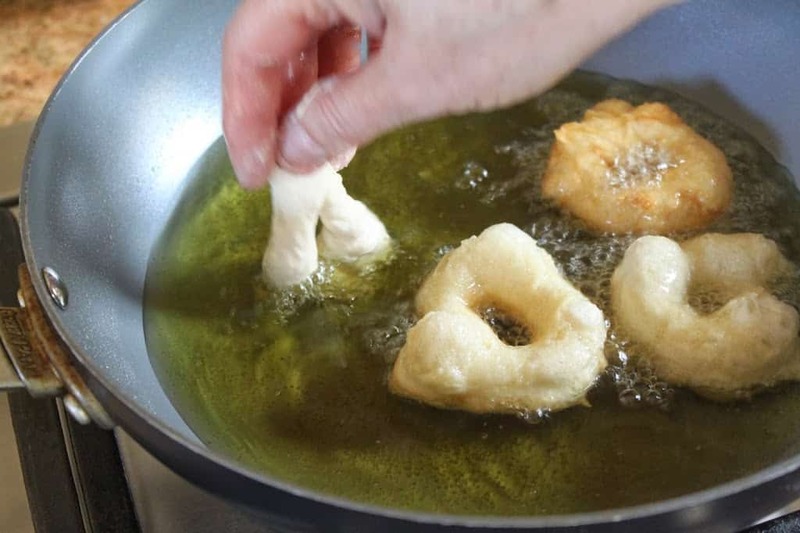 It is helpful to have another person frying the doughnuts while one person is shaping them, as it just too difficult to do both things at once, since the dough is so sticky. The frittelle will rise and cook quickly, so turn them as soon as they begin to brown on one side. Once they are cooked, remove them from the oil and place on paper-towel lined plate for a minute or two. Dip the frittelle into the sugar and cover completely. Place on a serving plate. Best eaten the same day. 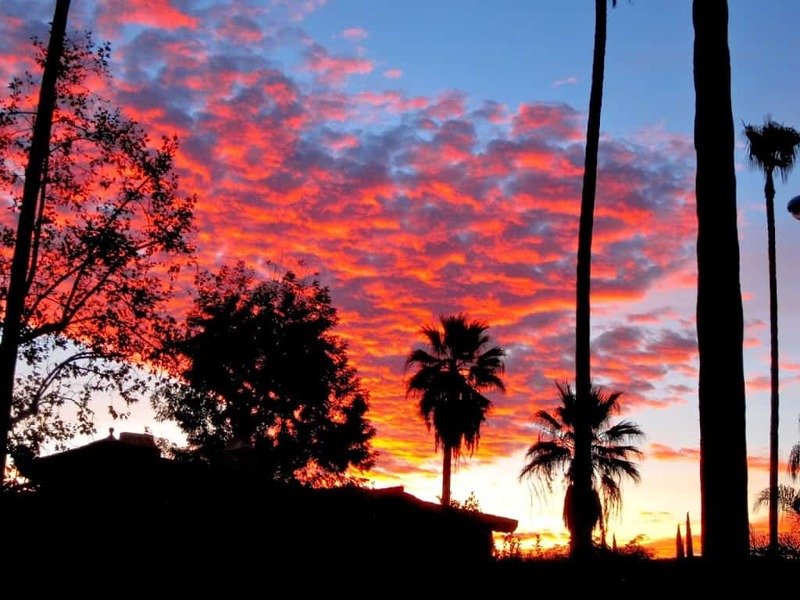 a winter sunrise from my back door. God bless you for keeping it real! My mother’s family was from Sicily. She made a fried dough with a mild anise flavor but no fruit that was rolled in plain granulated sugar. I’m guessing on the spelling- spinghi, pronounced like speengee. I have no recipe for it. Is that familiar to you? 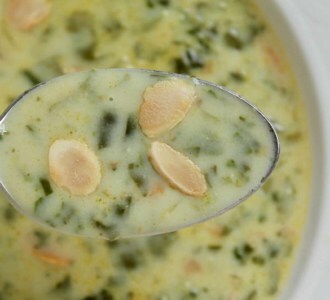 Hi Kathleen, I think this recipe has many different versions across Italy (as well as different names). I haven’t heard of spinghi, but Sicilian is soooo very different in their language than Italian, so I’m not surprised. :) Thanks for the comment! so true! 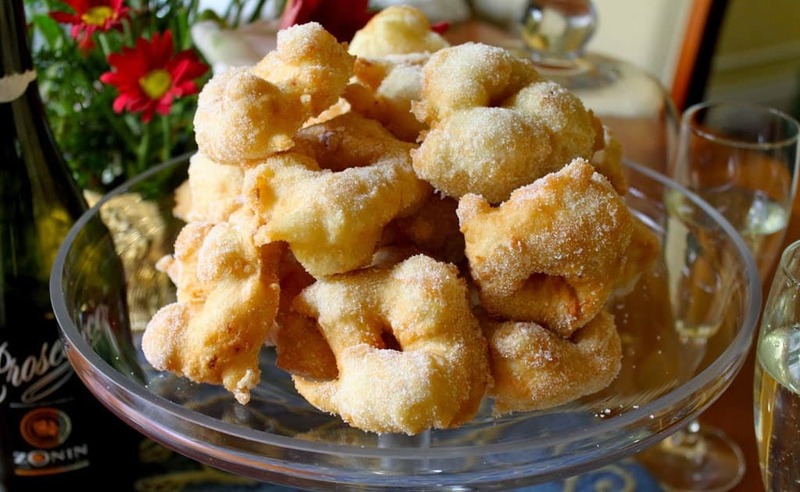 I’d been looking for this zeppole recipe for such a long time. Every Christmas Eve morning my mom and I would make these together and I don’t have a written recipe..I do it now from memory. My mom made this dough exactly as you describe (I know that you and she are from the same area of Italy which explains it). The only difference is that she would use tangerine juice rather than orange juice and she would use an assortment of liqueurs to put in the dough..not just rum. 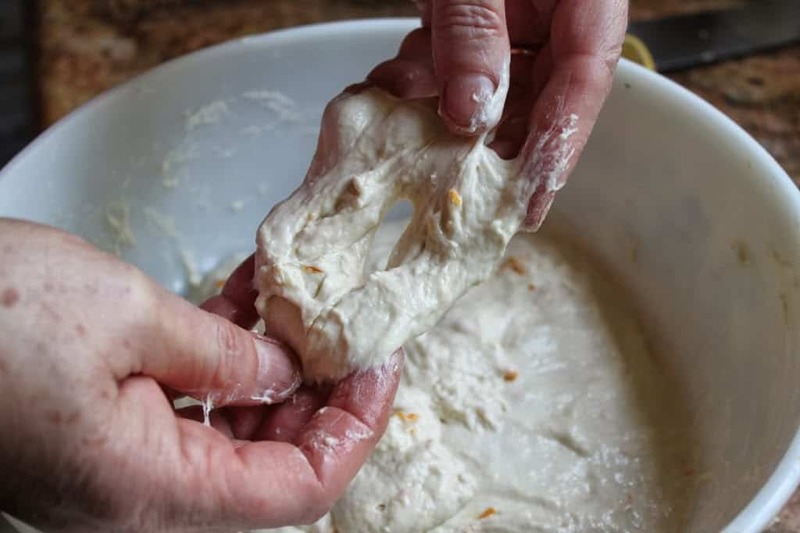 She would also add pignoli to the dough which I love because it gives the zeppole a nice texture when you bite into it! I already have and I have to say what a pleasure it is to come across such familiar ones too! I haven’t searched all the recipes but I’d be curious to know if you have one for stuffed artichokes? 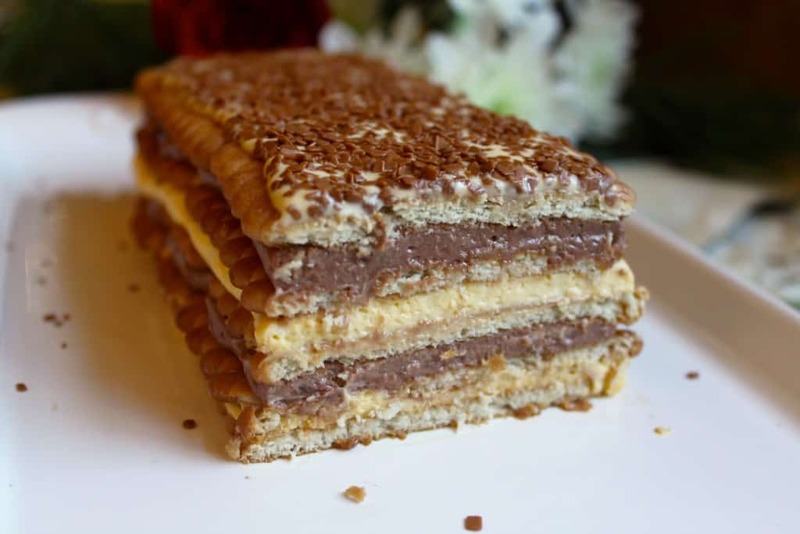 All the recipes that I’ve seen are totally different from the way my mom used to make them and I’m thinking that her recipe was truly regional and that I won’t find it elsewhere. I know that artichokes scare a lot of people..lol!! Kathleen, my Sicilian grandmother made those too. We also called them something similar: phonetically “sfeengee.” She made anchovy-flavored ones. Anyone ever freeze the doughnuts after fried? I need to take them to another state and want them to be good not hard and crumbles by the time I get there. Don’t do it, Linda. They’ll be yucky for sure. You may be able to freeze the dough? I’m not sure, but can tell you not to freeze them after frying. Thanks for that recipe Christina. It’s completely different from my mom’s. I’ve never seen a recipe that my mom (and I) use for artichokes…have no idea where she got it. Basically after cleaning the artichokes she would sautee garlic in olive oil, add beaten eggs, add chopped mint and lots of parmesan cheese. When cooled she would fill the centre of the artichokes with this mixture after dusting the artichoke with olive oil and salt and pepper. She would also add a piece of sausage to the middle as well (*except for mine because I don’t eat pork). She would then braise the artichokes in lots of olive oil, garlic, cheese and water and when cooked she would remove them and cook minestra in the same pot so that they would get all the flavours of the artichokes and then she would return the artichokes to the pot before ready to serve. Mint and artichokes is a marriage made in heaven I think!! Absolutely..though sometimes I get impatient and buy artichokes even when they aren’t in season..not as good but better than nothing. I only use mint with artichokes and with minestra…not the same without them! This is the dough my mother used as I now do. I don’t use citrus zest or raisins. I wrap the sticky dough around 2 or 3 slices of thinly sliced apple and then drop in hot oil. After draining on paper I roll them in granulated sugar. My children and grandchildren love these as part of our Christmas Eve dinner. My mom would make what we call scrapelle every Christmas Eve. We did not put suguar or lemon in dough. We would make them long and sprinkle sugar when they are still hot. I would usually eat about 3 or 4 while we were making them. I have not made them since my mom passed away 3 yrs ago. I would go over and help my mom with my daughter as I got older. The problem is the dough was already done so I helped her to fry it. I do not have the exact recipe. I would like to make them this Christmas Eve . We also make scrupelli, we are from Abruzzo. We put fresh rosemary leaves in the mixing water just for flavour. Like a weak tea. My mother had taught me. Wow, that’s a neat idea! Thanks for the note, Betty! Our Italian family used to put anchovies in some of the donuts……..tradition……….. Depends on a lot of factors but probably about 2 hours at least unless it’s really hot. Oh, my goodness! Raisin Balls! That’s what we called them as kids…my great grandma, Chiara Rotundo, made these and fried dough (“fritte”) every Christmas Eve, along with baccala cooked in tomato sauce served on perciatelli, tons of fried smelt and calamari and fried baccala, too. 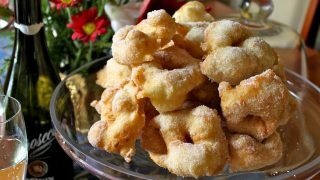 I can remember my grandma, Adeline, helping her the week before preparing the zeppole–there were bushel baskets of them. I try to explain this to my kids, but they really just don’t get it–there were so many family members there that we ate in shifts! 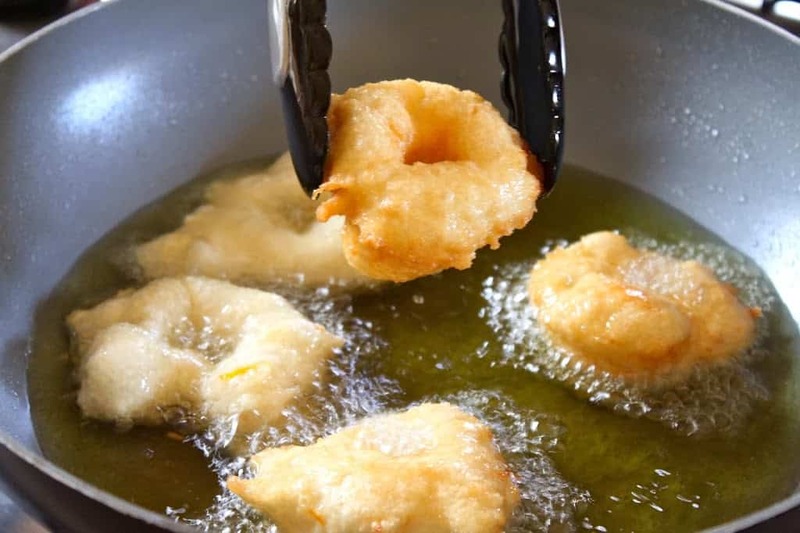 I still prepare the baccala (my dear dad is 87 & just loves it) and my 18 year old son helps with the smelts & the calamari…but I haven’t tried tackling the zeppole yet…now you have given me reason to try this next year! Thank you so much!!! You’re talking about the ciambelle made with potato that looks like a regular doughnut? But they don’t add pepper to those, at least what I know and my family is from Frosinone. Are you sure it’s not been changed after coming to the US, Patricia? Very cool! Never heard of them being made with potatoes! Omg I have been looking for scapels recipe My husband has raved about them for 30 years. His grandmother use to make them at christmas and put them in brown paper bag. Do you have the recipe. 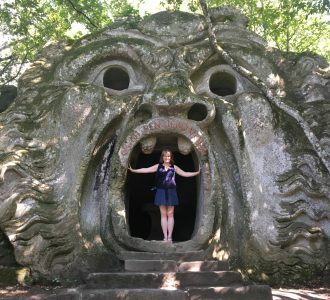 I don’t, but am off to Italy this week. Will see what I can do! Hi Lena, my mother and I haven’t heard of these either, but she suggested that you could try using this recipe (without any sugar) and add the orange rind and black pepper to the best of your memory. Good luck, and hopefully someone might read this and has the proper recipe for you! Merry Christmas! Oh my goodness! I have been looking for this since my Italian Nona went to heaven! Thank you so much! Thanks for the quick response Christina. I used a measuring cup, will try with a scale next time. 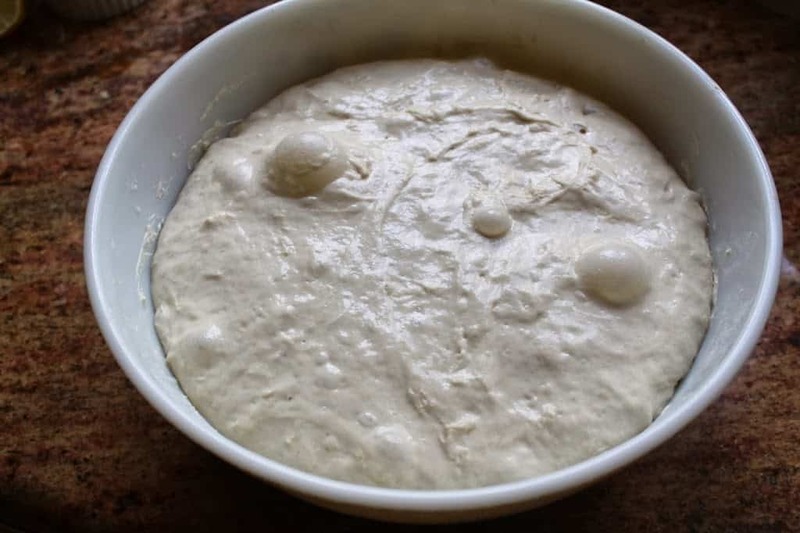 My dough looks the same as yours and rises well but maybe I don’t leave the yeast for long enough before adding….it doesn’t bubble or anything to let me know it is ready. Also, I don’t knead the dough at all, only mix it together. Would love to send you a photo, the finished product looks identical to yours, only very chewy texture, they get eaten regardless! Thanks again. Let me ask my mother as maybe she has some better insight. Will get back to you soon!! I have made these three times now, taste is perfect but dough is always tough. Any ideas what I could be doing wrong? Thanks anyway, lovely to have the recipe…hubby is Italian! Hi Pippa, sorry to hear that the dough is tough. First of all, are you using a scale or cups? A scale is always best for baking (I highly recommend them for baking). Secondly, does your dough look like it does in the photos, as in super wet? Shouldn’t be tough at all, but super light, so maybe it’s not rising long enough? I need more info to troubleshoot for you, so tell me as much as you can. Thanks! We make zeppole with salted cod. SO GLAD TRADITION HAS CONTINUED WITH OUR CHILDREN AND THEIR FAMILIES. 4GENERATIONS. That is wonderful Paulette! Buon Natale! 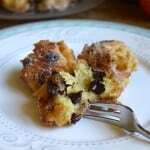 Amazing fritelle recipe! Super airy and pillowy, love the addition of lemon juice and zest,just a hint of citrus,Lovely!! had to dip in red wine to eat. oh how good they were. (not besqutittes) buy a hard molasses cookie. I’m so sorry, but I have NO clue and I even asked my mother who is here right now. Did you try google? I’d do an image search and that way you might be able to spot the ones that look the most similar. If from Naples we call them Roccoco, not sure of spelling. Only see them in Italy. Their hard as a rock very dark and round. Thank you, Roseann! I’ve never heard of those. These look delicious. Are you using canola oil? If not, what type of oil? 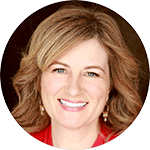 Hi Mimi, I used to use canola oil until I discovered it is mostly all from GMO plants :( I now use grapeseed oil until I find out that will give us cancer, too! Goodness, I’m tired of what they are doing to all of our food products! Hi. How long does dough take to rise? Thx. Thank you for this recipe. I am going to try this one next attempt. I used one today without the sugar in the dough. It calls for it to be added after it is fried. Your recipe is much closer to what I remember, so I am thrilled to have found it. I am looking forward to looking at more of your recipes! Trust me, I feel your frustration every day that I am on the internet. One of the goals I have on my site is to try to avoid the end of authentic Italian cuisine in the US and beyond. People no longer know what Italian food really is because there is so much misinformation out there :( Call it American-“Italian” if it’s a non-authentic version of something, but nothing burns my cookies more than seeing a recipe entitled “authentic” when nothing could be further from the truth. That recipe was awful, and that makes me even more excited to try yours. The temperature suggested for the oil was even too high, so I followed your suggestion there. They cooked up beautifully, so I can’t wait to make this recipe. My daughters are out of town this week, so I am waiting for them to get home before making them. I will let you know how it goes. I am curious if you have tried them with confectioners sugar on them? Is it simply a preference issue, or is it something else? The recipe I used called for confectioner’s sugar, but it seems as though it would have been better the way you suggest. Thank you for the reply! Honestly, this is the way Nonna made them so we’ve just continued to make them like this (with regular sugar). They’d have to be cool to use powdered sugar, but just a preference I would assume. Much the same as a sugared doughnut and a powdered sugar covered doughnut (I prefer the normal sugar on those too)! Enjoy! Yes, definitely made these on Christmas Eve only, but really great as an appetizer any time. Our family tradition for frittelle was a savory dough filled with anchovies (1 small can). We made these as our family gathered and prepared the other Christmas Eve dishes. A great appetizer that goes well with wine or beer. The recipe is the same except omit sugar in dough (add chopped anchovies) and do not powder with sugar after frying. This brings back so many great memories of Christmas Eve with mom and dad who both came to America from the area around Naples, Italy. Enjoy! Re: recipe for savory frittelle by Anna Castelli Korch. Correction – procedure for making savory frittelle is same but omit sugar, lemon, orange, raisins, and juices from recipe. we have them heated in the oven until warm and crisp with eggs for breakfast the next morning. 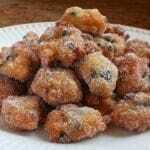 I know they are called Zeppoli in some regions. Note: My Mother always had a saucer with oil nearby, she dipped her hand in to grab a piece of dough so that it would not stick. It works! Buon Natale!!!! That’s lovely, Maria! Thank you for your note! Scarpetta would signify a little shoe; it’s so funny how everything has so many different names in Italy! Thanks for the oil tip, we’ll try it on Thursday! Grazie, e Buon Natale, anche a te! Oh my. These look rather dangerous – of course we couldn’t just eat one. It’s almost as if I could smell them from here. What a lovely Christmas tradition! Buon Natalè ! Thanks for the recipe. I followed it exactly but I had to guess when to add the juice and zest. Also, after 3 hours my dough didn’t rise exactly and it looked more like pizza dough, not as fluid. Taste was there, flavor excellent a little heavy and yielded 16. Any tips for correcting these issues? Our family is related to Patty who responded earlier. We also call them “cershpellas”. After Christmas Eve dinner, we all enjoyed as a dessert. Extras were divided up between the families. Chrtmas Day tradition is to toast them in the oven and eat while opening Christmas gifts! Hi John! That sounds like dialect for sure! I hope the names and traditions don’t die…they are so wonderful! Re;Fritellas [my family name for them Pittells] My Mother always made lots and lots on Christmas Eve, everyone loved them,I still do them on Christmas morning, we have open house and all my English friends come round to eat them, mine look exactly the same as yours but I always use an egg. Ohhh! Christina! These have such great memories for me. My dad always made them at Christmas (he was a great baker). We lost him 4 years ago, and my niece has tried to carry on the tradition (although I didn’t get to try her version). This makes me so happy to see! We always called them “crescpelle” (or something). Not sure why – dialects, maybe? So sorry about your Dad, Patricia. Yes, there are SO many different names for all these recipes, even villages a short distance apart will have different names, but one thing is: they are all delicious! I hope you can recreate your Dad’s recipe, as that would be lovely. Your pastries are tradition and the recipes seem so easy, that I’d like to try them. 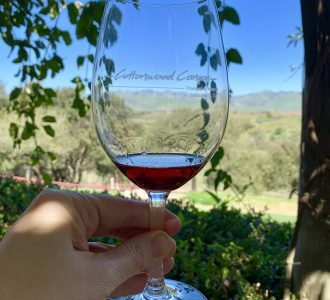 Hi Christina, I really enjoyed reading your post. My mother, who was Italian but had a Greek sister-in-law, used to make a very similar sweet called loukoumades, which consisted of a sloppy yeast batter, which she then dropped spoonfuls of into hot oil and fried till they puffed up and became golden.She then drizzled them with warm honey and cinnamon, and sometimes chopped walnuts . Very moreish! I will definitely try your recipe. Thank you! When you said in your intro that theses were known in a local dialect as torciniegli I decided I finally found the donut my great aunt used to make at Christmas! Excuse the sound spelling, but she called them toochaneili and used golden raisins. 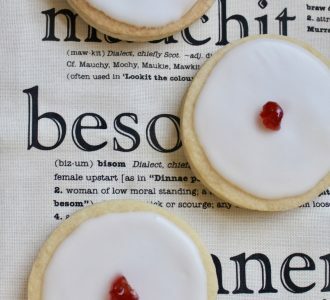 I have wanted to make these for years but could find no reference to what we called them anywhere! Bless you and Pinterest! 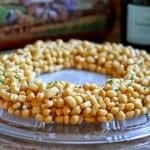 My mother used to make them and she would add the pine nuts also. Still have her old recipe in Italian. I love frittelle, they are similar to zepole I think. Fried dough is just the best. 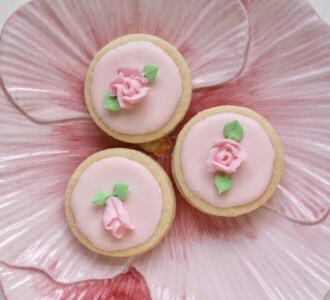 My Aunts made these, I remember them being served on Christmas. Love them warm and sugary with a cup of strong coffee. Oh I want one, wish I had someone else here to help me make them. I will have figure out a way to make them myself. Merry Christmas!